Not to be confused with Cherokee, Oklahoma. Cherokee National Capitol in Tahlequah. Cherokee County is a county located in the U.S. state of Oklahoma. As of the 2010 census, the population was 46,987. 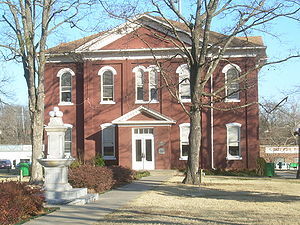 Its county seat is Tahlequah, which is also the capital of the Cherokee Nation. Cherokee County comprises the Tahlequah, OK Micropolitan Statistical Area, which is included in the Tulsa-Muskogee-Bartlesville, OK Combined Statistical Area. 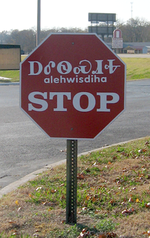 Cherokee stop sign with Cherokee language transliteration and the Cherokee syllabary in Tahlequah, Oklahoma, with "alehwisdiha" (also spelled "halehwisda") meaning "stop"
The Cherokee moved to this area as a result of the forced relocation brought about by the Indian Removal Act of 1830, also known as Trail Of Tears. The first significant settlements were at the site of Park Hill, where there was already a mission community, and Tahlequah, which became the seat of Cherokee government. However the Civil War divided the tribe and caused many of the early structures to be destroyed. Non-Indians began moving into the area illegally starting in the mid-1870s, and became the majority by the 1890s. In 1851, the Cherokee Male Seminary opened in Tahlequah and the Cherokee Female Seminary opened in Park Hill. The latter burned down in 1887 and was rebuilt in Tahlequah. A 1910 fire destroyed the Male Seminary. 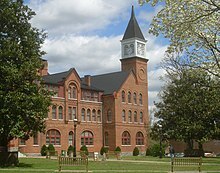 The Female Seminary became Northeastern State Normal School after statehood in 1907 and is now part of Northeastern State University. During 1901 – 1903, The Ozark and Cherokee Central Railway, which later became part of the St. Louis and San Francisco Railway was the first to build a track in the county. It boosted the shipment of farm products through the 1920s, but declined during the Great Depression. All rail service ceased in 1942. According to the U.S. Census Bureau, the county has a total area of 776 square miles (2,010 km2), of which 749 square miles (1,940 km2) is land and 2.7 square miles (7.0 km2) (3.5%) is water. The county lies in the foothills of the Ozark Mountains. It includes most of Tenkiller Lake and part of Fort Gibson Lake. The principal river running through it is the Illinois River. Grand River (Oklahoma) forms part of its western boundary. 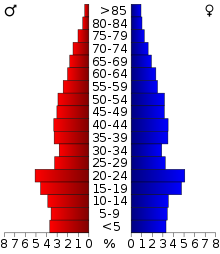 Age pyramid for Cherokee County, Oklahoma, based on census 2000 data. As of the census of 2000, there were 42,521 people, 16,175 households, and 11,079 families residing in the county. The population density was 57 people per square mile (22/km²). There were 19,499 housing units at an average density of 26 per square mile (10/km²). The racial makeup of the county was 56.41% White, 1.20% Black or African American, 32.42% Native American, 0.27% Asian, 0.04% Pacific Islander, 2.10% from other races, and 7.56% from two or more races. 4.14% of the population were Hispanic or Latino of any race. 92.7% spoke English, 3.8% Spanish and 2.7% Cherokee as their first language. There were 16,175 households out of which 32.70% had children under the age of 18 living with them, 52.50% were married couples living together, 11.90% had a female householder with no husband present, and 31.50% were non-families. 25.30% of all households were made up of individuals and 9.00% had someone living alone who was 65 years of age or older. The average household size was 2.52 and the average family size was 3.04. In the county, the population was spread out with 26.30% under the age of 18, 14.60% from 18 to 24, 25.70% from 25 to 44, 21.50% from 45 to 64, and 12.00% who were 65 years of age or older. The median age was 32 years. For every 100 females there were 96.30 males. For every 100 females age 18 and over, there were 92.10 males. The median income for a household in the county was $26,536, and the median income for a family was $32,369. Males had a median income of $25,993 versus $21,048 for females. The per capita income for the county was $13,436. About 17.00% of families and 22.90% of the population were below the poverty line, including 28.40% of those under age 18 and 13.80% of those age 65 or over. The Cherokee language immersion school in Tahlequah, Oklahoma educates students from pre-school through eighth grade. The Department of Education of Oklahoma said that in 2012 state tests: 11% of the school’s sixth-graders showed proficiency in math, and 25% showed proficiency in reading; 31% of the seventh-graders showed proficiency in math, and 87% showed proficiency in reading; 50% of the eighth-graders showed proficiency in math, and 78% showed proficiency in reading. Adams Corner Cherokee language chalk board in schoolhouse. The Oklahoma Department of Education listed the charter school as a Targeted Intervention school, meaning the school was identified as a low-performing school but has not so that it was a Priority School. Ultimately, the school made a C, or a 2.33 grade point average on the state’s A-F report card system. The report card shows the school getting an F in mathematics achievement and mathematics growth, a C in social studies achievement, a D in reading achievement, and an A in reading growth and student attendance. “The C we made is tremendous,” said school principal Holly Davis, “[t]here is no English instruction in our school’s younger grades, and we gave them this test in English.” She said she had anticipated the low grade because it was the school’s first year as a state-funded charter school, and many students had difficulty with English. Eighth graders who graduate from the Tahlequah immersion school are fluent speakers of the language, and they usually go on to attend Sequoyah High School where classes are taught in both English and Cherokee. Tahlequah is home to Northeastern State University. Northeastern State University is the oldest institution of higher learning in the state of Oklahoma as well as one of the oldest institutions of higher learning west of the Mississippi River. Tahlequah is home to the capital of the Cherokee Nation of Oklahoma and about 25 percent of the students at NSU identify themselves as American Indian. The university has many courses focused on Native American linguistics, and offers Cherokee language Education as a major. 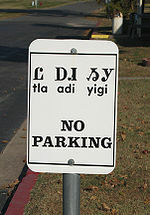 Cherokee can be studied as a second language, and some classes are taught in Cherokee for first language speakers as well. Since statehood, the economy of Cherokee County has been based on agriculture, especially production of corn, wheat and vegetables. However, the percentage of the population engaged in farming has declined from 62 percent in 1940 to 4.4 percent in 1990. This is largely due to increased urbanization around Talequah since World War II. Agriculture remains very important. In 2002, this county ranked first in Oklahoma for the value of nursery and greenhouse crops and seventh in the state for poultry and eggs. In the 1940 film The Grapes of Wrath, a policeman, portrayed by Ward Bond, tells the Joad family he is from Cherokee County, Oklahoma. On their 2015 self-titled album, the Turnpike Troubadours song 'The Bird Hunters' is a narrative by a native of Cherokee County, with the name being a prominent part of the refrain of the song. ^ Both of these statements are correct. All modern counties in the former Indian Territory became operational when Oklahoma officially became a state on November 16, 1907. The tribal governments became ineffective during the preceding years, while the new counties were being designated in the Oklahoma Constitution. ^ a b "State & County QuickFacts". United States Census Bureau. Retrieved April 27, 2014. ^ a b c d e f g h Burnett, Amanda. "Cherokee County," Encyclopedia of Oklahoma History and Culture, 2009. Accessed March 28, 2015. ^ "2010 Census Gazetteer Files". United States Census Bureau. August 22, 2012. Retrieved February 18, 2015. ^ "U.S. Decennial Census". United States Census Bureau. Archived from the original on May 12, 2015. Retrieved February 18, 2015. ^ "Historical Census Browser". University of Virginia Library. Retrieved February 18, 2015. ^ Forstall, Richard L., ed. (March 27, 1995). "Population of Counties by Decennial Census: 1900 to 1990". United States Census Bureau. Retrieved February 18, 2015. ^ "Census 2000 PHC-T-4. Ranking Tables for Counties: 1990 and 2000" (PDF). United States Census Bureau. April 2, 2001. Retrieved February 18, 2015. ^ a b c d e f g "Cherokee Immersion School Strives to Save Tribal Language". Youth on Race. Archived from the original on July 3, 2014. Retrieved June 5, 2014. ^ "General Information". NSU. Archived from the original on 2009-08-28. Retrieved 2008-02-20. ^ ' + auElement.html() + '. "NSU, Cherokee Nation Partner to Train and Hire Language Instructors - ICTMN.com". Indiancountrytodaymedianetwork.com. Retrieved 2015-07-17. ^ Leip, David. "Dave Leip's Atlas of U.S. Presidential Elections". uselectionatlas.org. Retrieved 2018-03-28. ^ [ url|id=06001113|title=United States Department of the Interior. National Park Service. "Park Hill Mission Cemetery - National Register of Historic Places Registration Form." December 6, 2006. Accessed March 4, 2016. This page was last edited on 28 February 2019, at 00:13 (UTC).